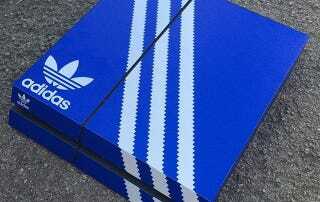 Consoles As Sneaker Boxes. Awesome. I’m not normally a fan of “skinning” my consoles. That stance may, however, be about to change. Via Kicks On Fire, Artist Dominic Low has designed a series of skins for the PS4 and Xbox One that turn them into famous sneaker boxes. The effect isn’t quite as successful on Microsoft’s console as it is on Sony—the fan on top interrupts the flow—but both ranges are still excellent. They’re not cheap—they work out to be around USD$40—but if sneakers aren’t your thing, there’s also a pretty sweet PS1 skin.